Taken Aback | Cover Story | Style Weekly - Richmond, VA local news, arts, and events. 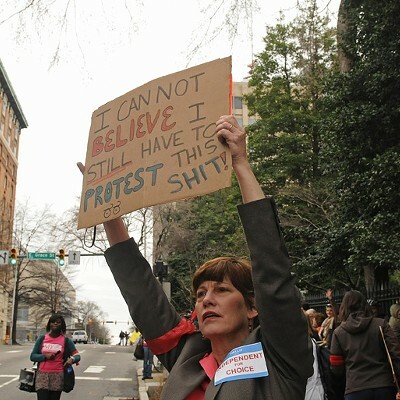 Over on the Style Weekly Facebook page, readers have been weighing in on the women's rights protest and the arrests. Join the conversation on that photo gallery here. 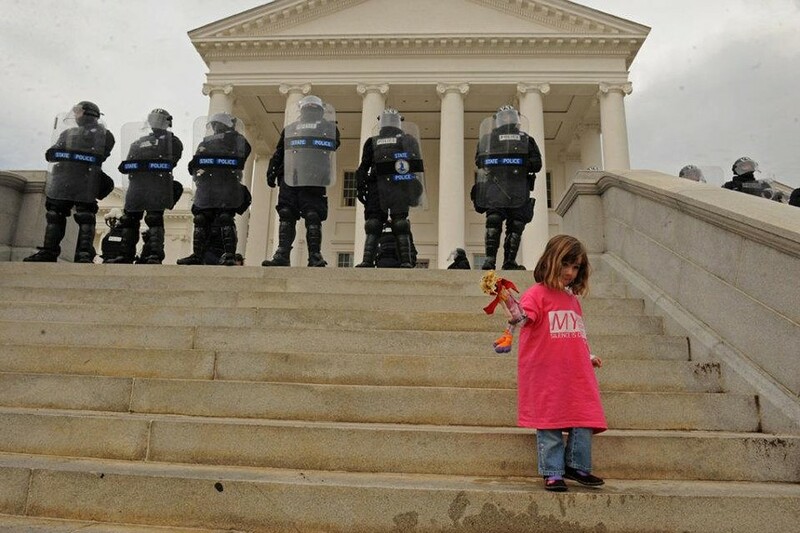 Seemingly unfazed by the police, Iris English attended the protest with her mother, Lynn English. 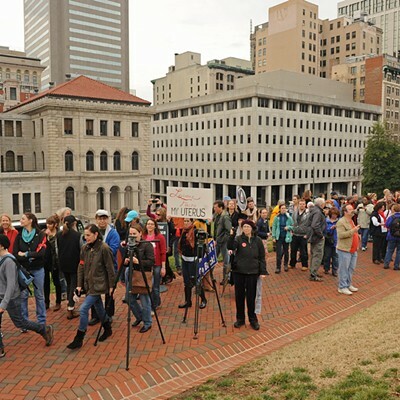 From outside the Bell Tower in Capitol Square, during their march along Broad Street past the National Theater, the federal courthouse and back again, a mass of protesters chant: "Not the church, not the state. 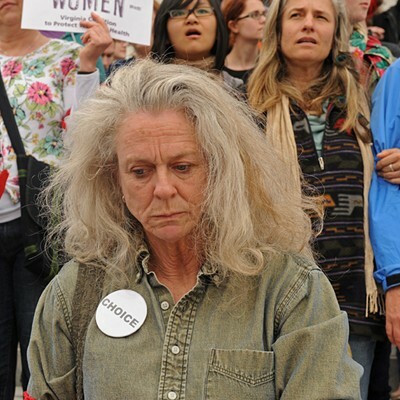 Women must decide their fate." By now it's likely that you've seen the images, headlines and news accounts of the weekend protest, which starts silently and devolves into police officers wearing riot gear and body shields and wielding rifles and cans of mace. But the thousand or so protesters don't back down. They keep chanting, they lock arms and many of them refuse to budge from the south steps of the Capitol because, as one observer puts it, "they were tired of begging for their rights." In Virginia's new political landscape, where the Republican-controlled General Assembly can muscle through legislation requiring any woman seeking an abortion to receive an ultrasound procedure, these are the front-line dissenters in a culture war that in the span of two weeks went from cold to hot. By the end of the day, 30 protesters are arrested and taken to jail. 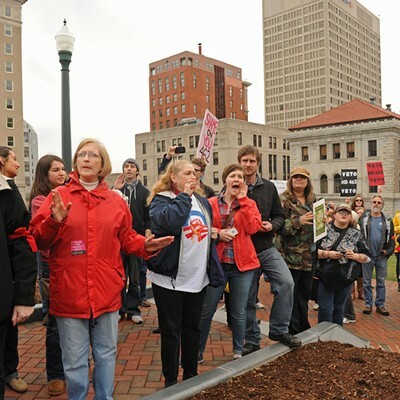 The March 3 rally ends a contentious two weeks in the statehouse, with anti-abortion legislation generating national headlines and late-night comedians riffing on government-mandated transvaginal probes. Legislation granting "personhood" status to children from the moment of conception was shelved until next year — it was thought. On Monday as Style Weekly was going to press, the General Assembly seemed to be considering a lesser form of the legislation. A bill requiring probing ultrasounds was amended, requiring only abdominal ultrasounds prior to abortions. There was no clean exit to the debate, and frustrations couldn't be bottled up so easily. They needed someplace to go, someplace to be heard. They go to the State Capitol. 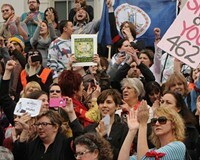 Estimates from the organizers, Speak Loudly with Silence, put the number of attendees at around 1,000. They're both young and old. Female, mostly. Their three-hour demonstration is filled with chants and speeches. 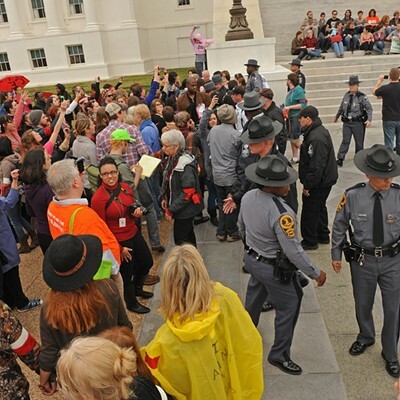 After being warned to vacate the south steps of the Capitol, 30 people — about half of them men, half of them women — are arrested on charges ranging from unlawful assembly to trespassing, according to Capitol Police. The tactics are familiar. So are some of the faces. You might remember some from Kanawha Plaza. Or Monroe Park. Many of those arrested were participants in the Occupy Richmond movement that for almost two weeks parked illegally in the downtown plaza, then moved to Richmond Free Press Publisher Ray Boone's front yard, next door to Mayor Dwight Jones. 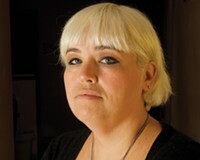 One of them, Claire Tuite, says that Saturday's arrests weren't planned. When the protesters emerge on the Capitol, some of them make an "autonomous decision" to "occupy" the steps of the Capitol. "This was a peaceful protest on taxpayer-funded property," Tuite says. "We have every right to be here." 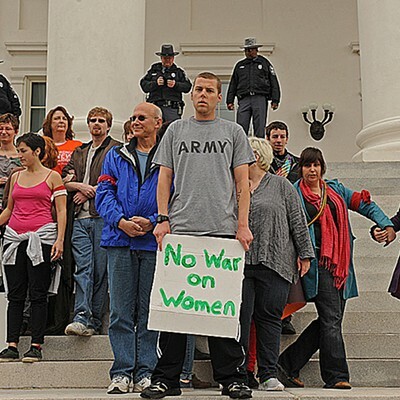 Molly Vice, press liaison for the group, says the arrests "shames lawmakers for passing regressive legislation that usurps the good judgment of women on their own health care for the state's." "It's an outrage," she says of the ultrasound bill. "We're here ... to tell truth to power that infringing on women's health is not OK. Not this year or the next." 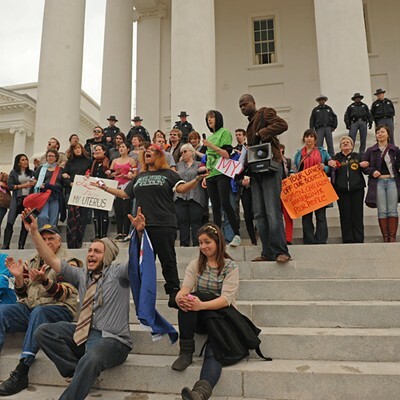 By Monday, the 30 people who were arrested are released, but after the weekend rowdiness that led to mayhem, and the countless photos invoking Vietnam-era police confrontations, Richmond can't seem to shake its increasingly repressive reputation. 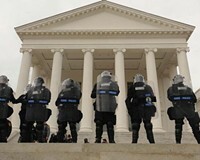 Democratic lawmakers blamed the protest and the arrests on Gov. Bob McDonnell and the GOP's social-activist lawmakers, and their agenda. Some, such as state Sen. Janet Howell, D-Fairfax, liken the police response to the protest to that of the 1960s, during Massive Resistance. 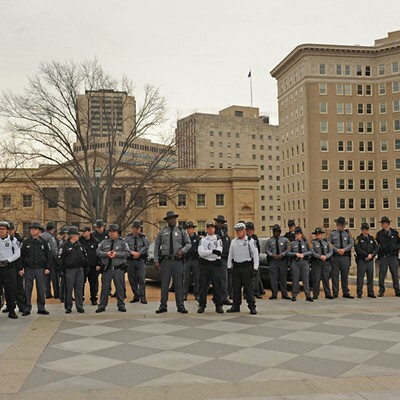 "Our State Capitol is becoming an armed garrison," Howell laments. In all likelihood, the officers called into duty on Saturday are just as apprehensive about the confrontation. They at times seem reluctant, hesitant, unwilling, but ultimately there to do a job. And that the protesters don't back down may be a testament to something else: Sometimes, we really do stand up and fight for what we believe in, no matter the consequences. As of Monday, the governor hadn't issued a public statement about Saturday's events, though he was scheduled for a news conference on the eve of Super Tuesday to recommend that voters cast their ballots for presidential candidate Mitt Romney. The headlines will fade, and the furor will die down soon enough. But the chants will echo in the online videos, the images, the newspaper stories, for months to come. "Tell me what democracy looks like," they call out. Increasingly, activity that was once was part of normal political participation has become criminalized.